When it comes to weeknight dinners, the easier (and faster) the better. 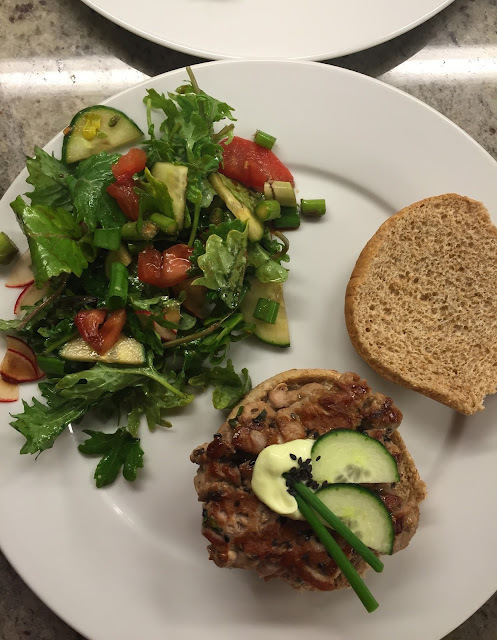 If you are looking for a new classic that your family will request over and over, and one that takes less than 15 minutes to prepare (start to finish), look no further than today's delicious and uber healthy Tuna Burger. 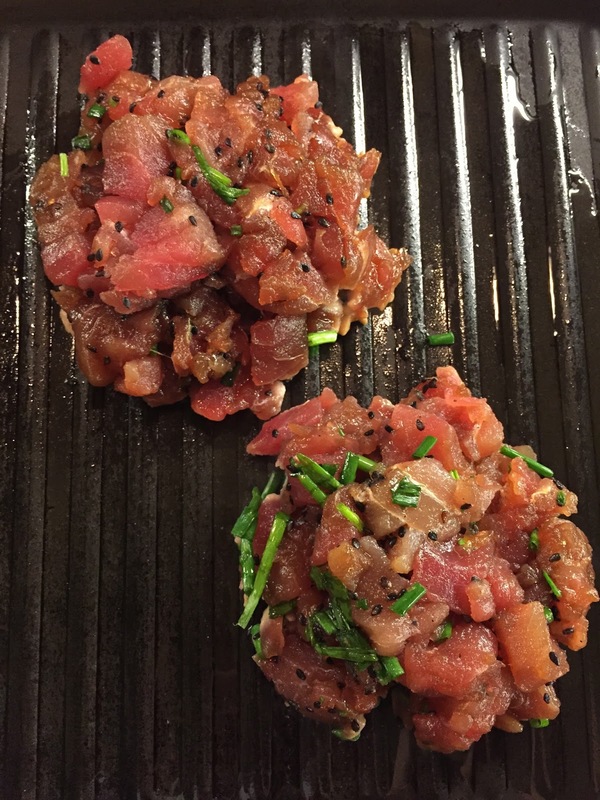 We will be presenting the recipe portioned for two, as one 8-10 ounce Tuna Steak is the perfect amount for two hearty burgers, but this is easily adaptable for your family, just double or triple the amounts as your needs dictate. We cook our burgers on a non-stick grill pan but this would be fine in any sort of skillet. Since the Burgers use no binding agent (breadcrumbs, egg, etc) which adds to the healthy factor, I would be hesitant to try making these on an outdoor grill as they would undoubtedly break apart. Don't skip the Wasabi Mayo! A little hit of spice really makes the recipe. Serve these open-faced to save even more on calories. They are still very satisfying. Enjoy and here's to less time cooking, more time enjoying. 1. In a bowl, combine the chopped Tuna with Chives and the Low Sodium Soy Sauce, a sprinkle of Salt and Pepper and the Optional Sesame Seeds. Form two evenly sized patties. 2. Spray a non-stick skillet with cooking spray and heat over medium high flame. 3. Cook Burgers 2-3 minutes on each side. They can be slightly pink in the middle if the tuna is high quality. 4. 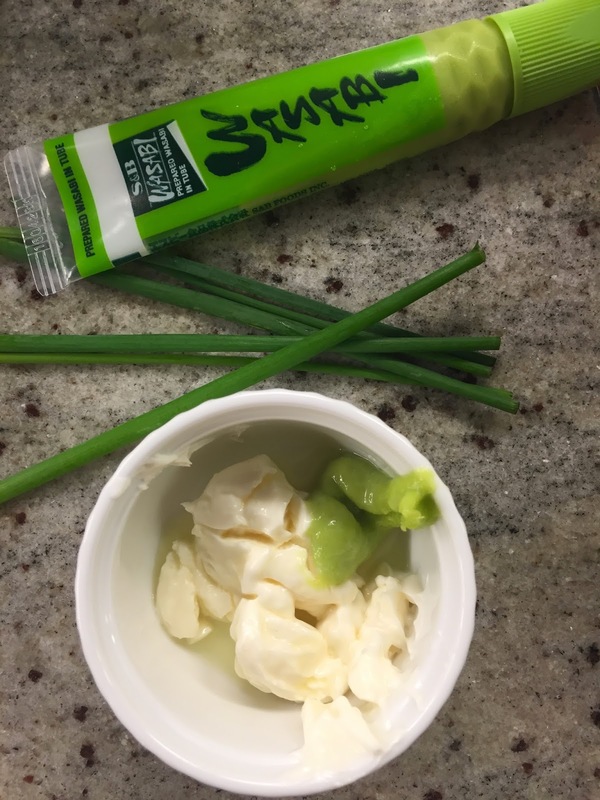 Meanwhile, make the Wasabi Mayo by combining Mayonnaise and Sour Cream with the Wasabi Paste. Adjust spice level to your liking and add a dash of Salt if you choose. Mix well. 5. To serve, place a Tuna Burger on top of the bottom half of a bun. Top with Cucumbers and dot with Wasabi Mayo. Affix two of the two inch chive slices to the Mayo. Enjoy!! We hope you had a wonderful Father's Day Weekend. Dads are worth celebrating and their importance cannot be overstated. From dads in the traditional sense to those who raise other people's biological children with love and care (to mothers who serve as fathers too) you make a difference! Ask any American Dad what their idea of a good meal is and you'll inevitably hear "beer and beef." My dad is no longer with us and even after almost ten years, I miss him nearly every day. He'd definitely have loved a dish like today's Vietnamese Marinated Flank Steak with Cucumber Salad. He was a great cook in his own right, and he taught me to be casual in the kitchen and not take myself so seriously (ok, that part is a work in progress!). Dad also truly appreciated good food. We made and enjoyed countless fantastic meals together- always along with many laughs. My wonderful memories of him sustain me. To this day, I still can't make a bowl of Linguine and Clam Sauce (his specialty) without thinking of him. There was one really bright spot this Father's day - celebrating my husband who is an amazing father too! was his idea entirely. I was excited to try making it because it's also wonderful exemplar of Neurotic Kitchen's much repeated mantra - fancy looking food need not be hard to make! Let's chat a bit about this dish. This is a really smart recipe. 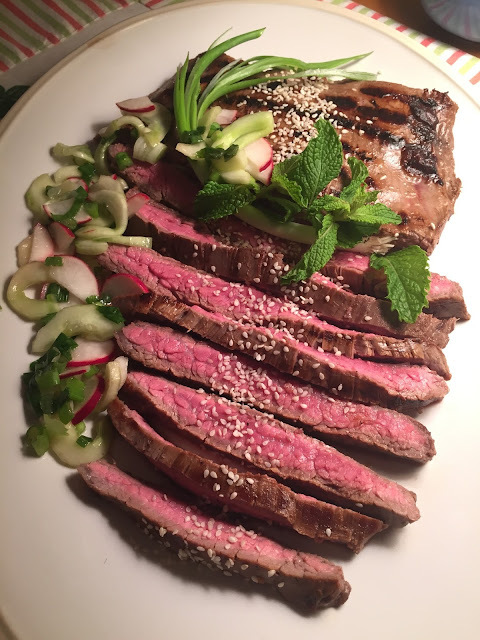 The Steak Marinade also serves as the zippy and delicious dressing for the accompanying Cucumber and Radish Salad that helps make this dish's presentation exceptional. More importantly, the result is as delicious as it looks. Since we did not adapt this recipe, I would like to share my experience making it in the hopes that it will be helpful to you so you can nail it on the first try (it's pretty foolproof!). 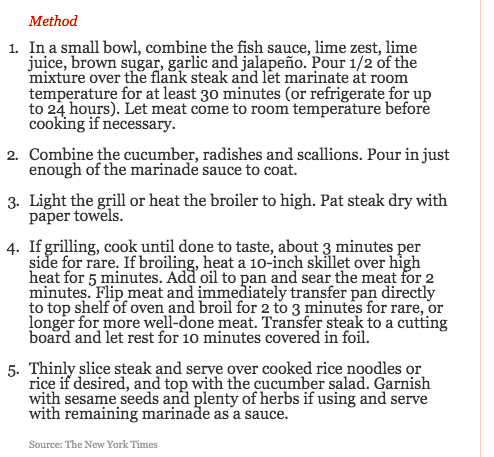 Timing the Marinade: The recipe recommends you marinate the meat between a half hour to 24 hours. We marinated this for 3 hours and the flavor was fantastic. I thought it was just right, actually. I don't know that it would benefit from much more time, not that I'd quibble with a recipe in the New York Times Diner's Journal. with the instructions for grilling. Since the weather wasn't on our side, we saved the charcoal and fired up my favorite double-burner grill pan (with griddle) instead. 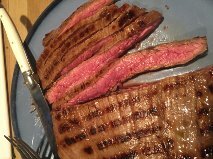 The Flank Steak, about 1.75 pounds came out a perfect medium rare (to the rare side) with a cook time of 4 minutes per side. The recipe recommends 3 minutes per side on a very hot grill for rare. 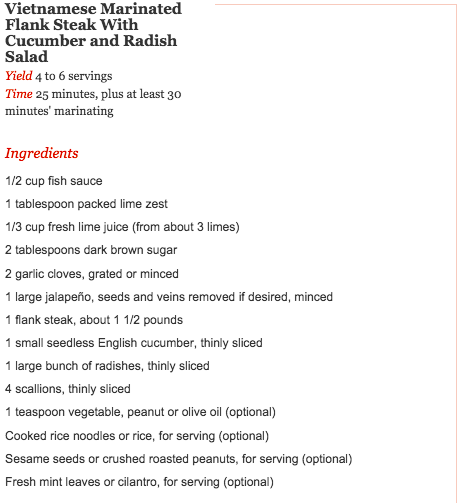 Portion Size: Admittedly, my husband and I are overly enthusiastic eaters but if you serve this without any other side dishes (entirely possible since the salad is included), I would say it is closer to 3-4 servings, rather than what the recipe says is 4-6. Serving: Allow steak to rest about 5 minutes and the slice the Flank Steak against the grain. Ever have a really fabulous weekend from start to finish? This past weekend was like that for me. Beautiful weather and wonderful scenery (we stayed at my family's home on Long Island) came together with a few fun activities, plenty of relaxation time and a nice meal. Let's not forget a drink or two. The only thing I had to remember on Saturday morning was to begin steeping my Cucumber Infused Tequila for the next 24 hours so it would be ready for cocktail time. Hand Monogrammed White Tin Pails filled with rocks painted with a cross. So simple and pretty! + lovely seaside venue Cowfish Restaurant. Sunday was set aside for family time so naturally I wanted to plan a menu. Since we were by the sea, I opted for a quick and classic fish meal. We have so many seafood menus here on NK (like this, this and this). That's because seafood is my favorite food and when it comes to making a fast and elegant meal, nothing is better. All you need is a really trustworthy fishmonger and half the work is done. I decided to prepare a simple main of Red Snapper & Asparagus on the grill pan, preceded by an appetizer of Steamed Clams as well as a quick Local Fluke Crudo (what's quicker than raw?) inspired by Esca in NYC. Crudo actually means raw, and when the word follows the name of a fish, what you're about to eat is basically the equivalent of Italian Sashimi. As with many simple preparations, the key to Crudo is very high quality fish and accompanying ingredients (such as great Olive Oil and specialty Flaked Sea Salt). This article from NPR.com is where I found the inspiration for the below adaptation for Fluke Crudo. It is a great read!! Before you cook, you'll need to have Cocktail Hour. For that, we went for the simplest and most refreshing Margarita of them all - no Triple Sec needed! The Cucumber Margarita made with your own house-infused Cucumber Tequila - just let Cucumbers sit in Tequila for 24 hours and voila. Get the recipe on Food and Wine. Now, without further delay, here is our Fluke Crudo recipe. Truly delicious and as simple as it gets. Here's to another wonderful weekend and many more sweet days of summer to all! Specialty Flaked Sea Salt (or other good quality coarse grained Salt. (we used French Grey Salt). In a small bowl, toss the Radish Matchsticks and Sliced Peppers with the juice of half a Lime and a sprinkle of salt. Prepare each serving plate by squeezing about a teaspoon of lime juice on it. 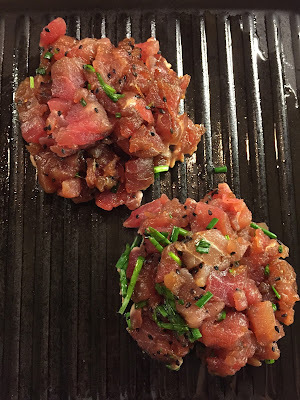 Place the slices of Fluke side by side or in a fan shape. Top with equal portions of the Radish and Pepper mix. Drizzle each plate a few times with high quality Extra Virgin Olive Oil. Finish with a sprinkling of Salt and serve with a Lime Wedge. I don't opt for strip too often because I am most partial to Ribeye. 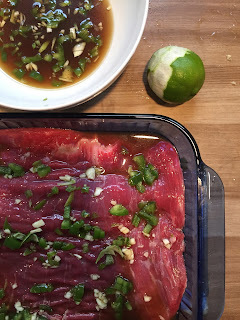 Skirt and Flank are my go-tos for everyday meals, but when I do reach for Strip, I am reminded that it really is delicious for Bistro-inspired meals (Edge of Eye and Hanger are excellent choices when you're looking for flavorful budget cuts). For me, New York Strip is the better half of the Porterhouse (Filet comprises the other side of my favorite super-splurge cut). Get yourself a good cast iron skillet. They are super affordable and cook meat, fish, even eggs, amazingly well. The secret is that cast iron evenly distributes heat. Our favorite brand is Lodge (9 or 10 inch is a great size to choose). Trust me, you will not regret it. Let me show you what Medium Rare is supposed to look like (pictured right). And here's how you do it. 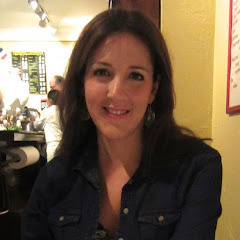 Keep reading for the Bearnaise Butter recipe! Season Steak on either side with Kosher Salt and Pepper. Add the Oil to the pan and heat over medium-high flame. Cook 3-4 minutes per side in a good, cast iron skillet. Allow to sit uncovered for 5 minutes. Spread with Bearnaise Butter* (at room temp) and serve! Divide the Minced Tarragon in half and drop half of it into a small bowl with the Vinegar. Allow to steep for at least 15 minutes. In another bowl, mash the Butter Up. Add the remaining Tarragon, Shallots, Wine, Tarragon and Vinegar mixture and combine. Sprinkle with Salt and Pepper and adjust as needed. You can utilize the Bearnaise Butter at room temperature or store it for future use rolled in Saran Wrap and kept in the freezer. Bring to room temperature before using. Spread Bearnaise Butter on Steaks before serving. Enjoy!